Are you running a business or handling a team of professionals? If yes, then you may be struggling with communicating via email, finding important files, and staying productive. That is where you need an easy project management software. Using software for project management helps you easily and effectively communicate with your clients and team. It also helps to keep things aligned and on track. When people are looking at project management tools online, I always like to recommend Wrike to help them manage their team. Wrike is the best and most recommended workflow management software. It is an advanced tool which makes you work smarter and more effectively. It helps you to assign jobs, keep track of team performance, and complete the projects on time. With the help of Wrike, you can easily set up different tasks and assign them to your team members. You can not only plan and organize the projects but also improve communication and track the performance. Top businesses like PayPal, Purestorage, Hootsuite, and Umpqua Bank are also using this tool. Wrike suits every teams’ wants and needs. 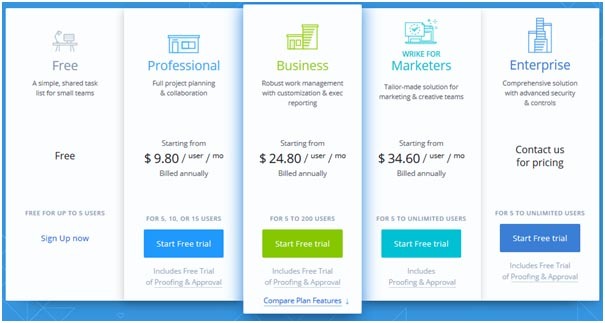 Wrike offers solutions creative teams, project management teams, product development teams and can even work as a marketing management software for marketing teams. Wrike helps you create, plan, collaborate, report, customize, integrate, and support your teammates so you can complete your tasks effectively. It’s also a project scheduling software that allows you to track the performance and work done by your team. The most common issue which companies face is that when work passes from one team to another, sometimes they go off track or don`t know what to do next. Gantt chart software can help with this, but is often not flexible enough to be an all-in-one solution. Wrike helps you to connect your team in real time so they can easily understand what to do and when. If your team needs more information about the project then they can also check the previous work done on the same project. The free project management app allows you to track your projects on the go. Having trouble tracking the work and performance of your team? Wrike`s time tracking feature is really effective. It allows you to check how much work has been done and how much is still pending. 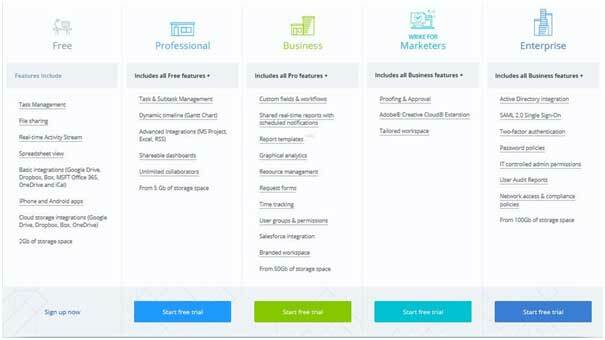 Wrike service offers 5 different types of plans for the businesses according to size of team and the features you require. Free: For small teams. Up to 5 members. Professional: For complete project planning and collaboration, Price $9.80/user/month. Up to 15 users. Business: Extensive work management with complete customization and reporting. Price $24.80/user/month. From 5 to 200 users. Marketers: Tailored solution. Price $34.60/user/month. Unlimited users. Except the Free plan, all other plans also includes free Trial of Proofing & Approval. Now, you should see how Wrike is for everyone. For a small team of 5 users free plan is the way to go, but if you need more extensive support and want more members on your team to use the tool, then try out a different plan.